Correction at 4:55 PM EDT: Loop A pressure raised from 140 psi to 160 psi and then 330 psi. "We had an extremely successful EVA today," said Kirk Shireman, deputy manager of the space station program at the Johnson Space Center. "We're very pleased with the reswults. We still have some more activities this afternoon and tomorrow to fully recover from the pump module failure, but things are certainly looking positive and we're looking forward to that." 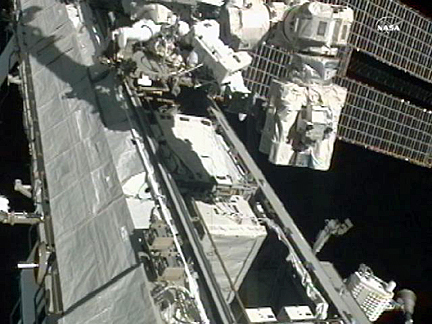 repair spacewalk. The old pump is visible in the center of this view. 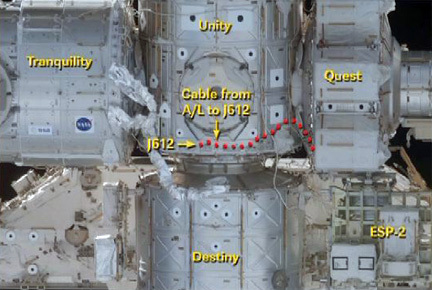 The spacewalkers had hoped to finish the excursion by installing a long extension cord between the Quest airlock and the Unity module that is needed before attachment of a cargo module during a shuttle visit in November. After the spacewalk ended, flight controllers worked to repressurize loop A. McMillan said the plan was to first raise the pressure from 140 pounds per square inch to 160 psi and finally, 330 psi, the normal operating level. After monitoring the system's performance overnight, controllers planned to briefly shut down the loop Tuesday, allowing systems that had been temporarily shifted to loop B to be reset for loop A.